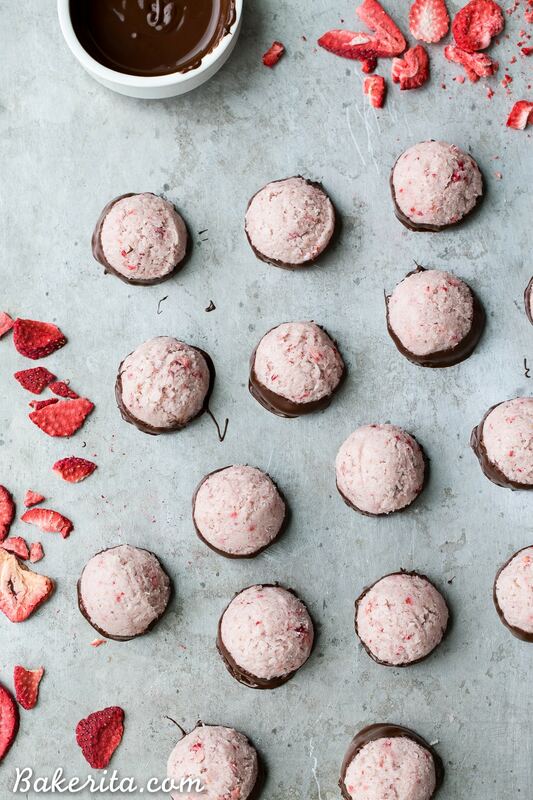 These No-Bake Chocolate Dipped Strawberry Macaroons are packed with strawberry flavor! It’s hard to resist these creamy gluten-free, Paleo + vegan coconut macaroons, and the chocolate dip and drizzle makes them even more delicious. I feel like I’ve rekindled my love for baking, post-Whole30. Not that it even left, but after not being able to make many of the recipes I dreamed up during my baking-free month, it feels so good to get back into the kitchen to create a whole bunch of new dessert goodness. Testing, tasting, and tweaking recipes are some of my favorite things (obviously) and after a month without it, I really missed the process of developing new recipes. Of course, I did it during my Whole30 with my Whole30-approved recipes, but I wasn’t testing nearly as much as normal. Last week I had my first few full-on baking and recipe testing days, which are obviously my favorite days! What’s not to love about a kitchen full of homemade treats?? 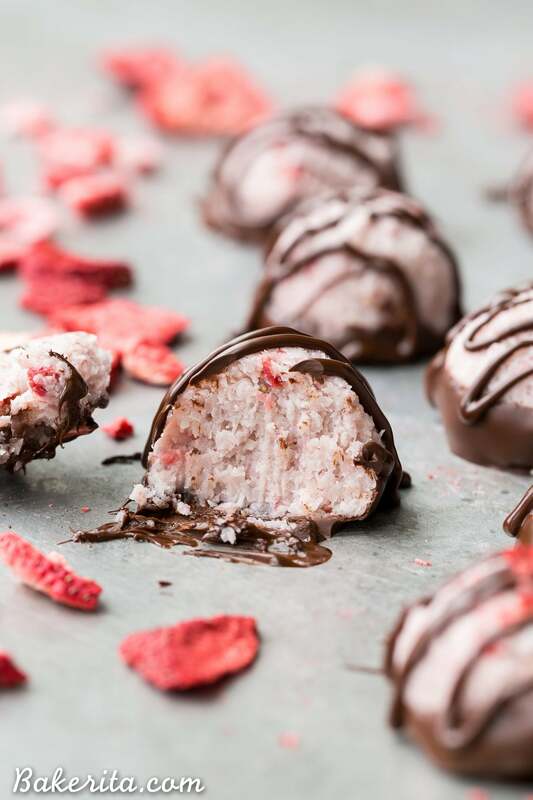 While I had a few recipes not go as planned, these No-Bake Chocolate Dipped Strawberry Macaroons turned out like a charm, as I suspected they would. In fact, I think they’re even better than I could’ve predicted. Of course, these aren’t exactly baking since there’s no baking required, but doesn’t that make it even better? It’s so easy, you can’t really mess these up. That’s my kind of recipe. I was tempted to call these Strawberries & Cream Macaroons because they are seriously creamy! Besides the regular shredded coconut in macaroons, these also use coconut cream to help bind them together. That makes these luxuriously creamy and soft, as opposed to the more chewy baked coconut macaroons. A little coconut oil helps them set up. The bright strawberry flavor comes from freeze dried strawberries. Freeze dried fruits are some of my favorite to use in baking because they pack a big PUNCH of flavor and color, and you don’t need to compensate from any moisture that would be added from using the whole fruit. I get mine from Trader Joe’s but most Kroger stores also carry freeze dried fruit, and you can find it on Amazon. Only a little maple syrup is needed to sweeten, and a touch of vanilla extract rounds it all out. The mixture is then scooped out with a cookie scoop to create little bites. From here, you can leave them be if you want! 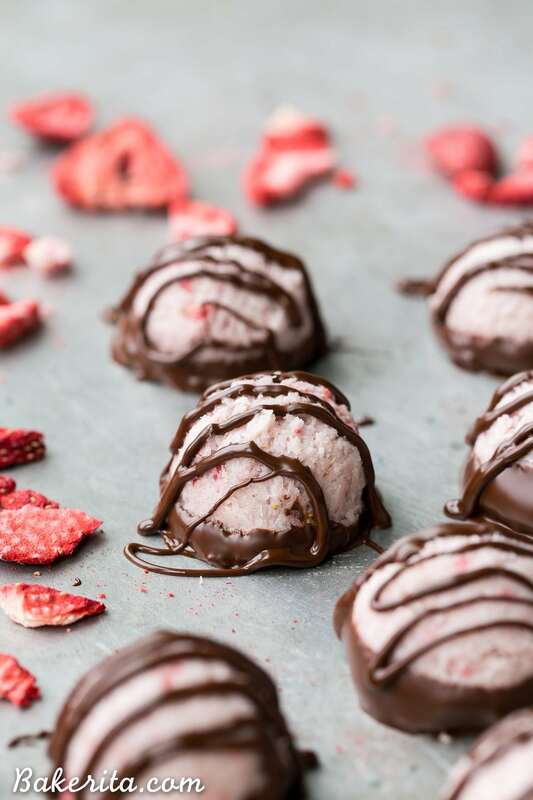 They’re SO good, even without the chocolate, so if you’re craving a more fruity treat, you can definitely skip the chocolate and devour them without it. Of course…I took the extra step and gave them a little chocolate dip and drizzle. There’s nothing better than chocolate and strawberries, so it was a match made in heaven. The chocolate also gives them structure because they’re a little soft without it, so you get that nice snap when you bite into the chocolate shell. 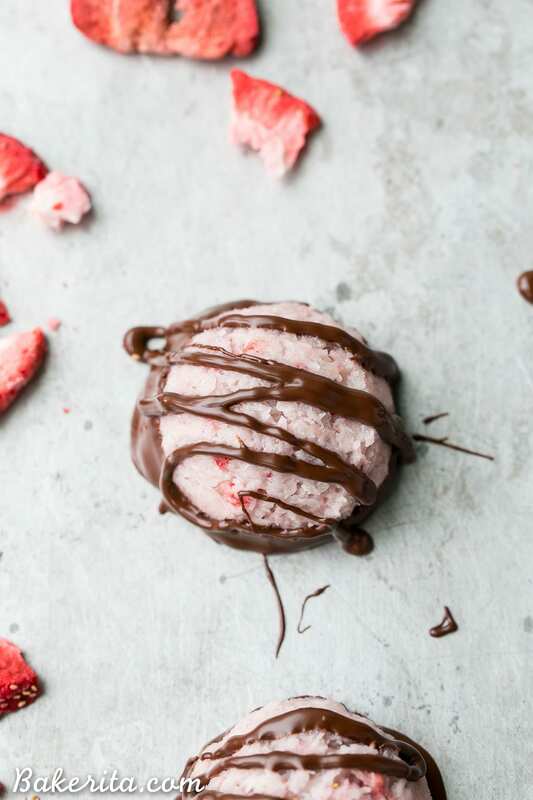 These No-Bake Chocolate Dipped Strawberry Macaroons are made with such wholesome ingredients, but they’re jam packed with flavor and have the most irresistibly creamy texture. The chocolate and strawberry flavors complement each other perfectly, especially when paired with the creamy coconut. And since there’s no baking necessary, you can be devouring these in just a few minutes. Enjoy!! 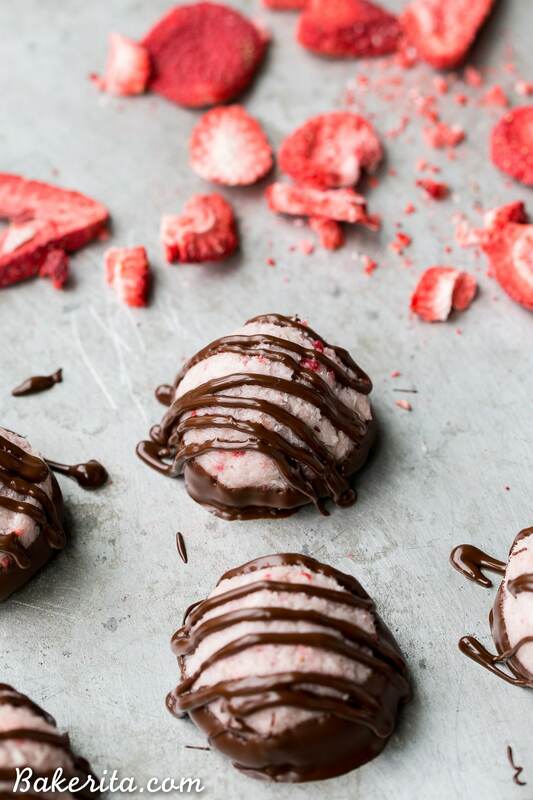 These No-Bake Chocolate Dipped Strawberry Macaroons are packed with strawberry flavor! It's hard to resist these creamy gluten-free, Paleo + vegan coconut macaroons, and the chocolate dip and drizzle makes them even more delicious. Crush freeze-dried strawberries into a powder. Set aside. 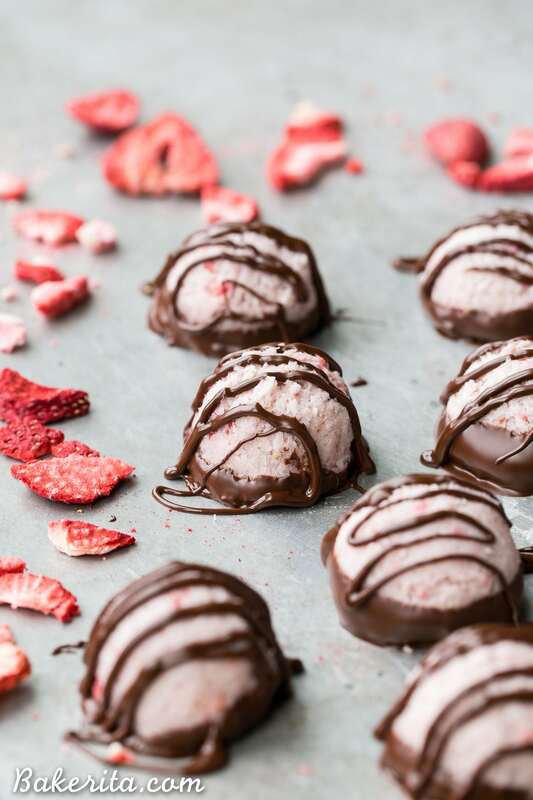 In a large bowl, combine the coconut, coconut cream, coconut oil, maple syrup, vanilla extract and freeze-dried strawberry powder and mix well until fully combined. Use a small cookie scoop to create scoops with the coconut mixture and place on a tray lined with parchment paper. Transfer to the fridge until hardened. Once they’re firm, dip the bottom of each coconut ball in the dark chocolate and return to the parchment paper. Drizzle with the remaining dark chocolate. Transfer to the fridge for the chocolate to set, then enjoy! Store leftovers in the refrigerator. These macaroons are so pretty, Rachel! And even better that they’re no-bake. Yay for recipe testing and baking days, those are the BEST! Agreed!! Thanks so much, Gayle. These macaroons are BEYOND pretty and gorgeous, Rachel! How perfect would these be for a springtime party? I LOVE how allergy-friendly you made them too! Haha I thought I would be the same way, Cheyanne, but it ended up just showing me a whole bunch of new foods to enjoy. Thanks so much, lovely! It’s definitely nice to be reinvigorated! Thanks so much, Dawn. Thanks Izzy! Hope you love them. WOWZERS! I love that you posted this recipe right when I received some freeze dried strawberries in the mail. Talk about perfect timing…and a perfect way to put them to use. It is hard to be away from baking for a while isn’t it? And a whole month? That’s a very long time. You came back with a vengeance! Chocolate dipped macaroons are one of my favorites, and I love the strawberry twist here. These are just so pretty! Hey Rachel! I just tried this recipe and unfortunately it didnt turn up well.. the mixture was so mouchy that they didnt freeze.. even though I left them in the fridge overnight, they were sticky and didnt hold their shape.. any ideas what went wrong? Hi Amber – I’m so sorry you had trouble! Did you use only the thick part of the coconut cream? If it was too thin, that could have made the difference…the coconut oil should’ve helped thicken it up too. You could try adding some more melted coconut oil (which will help it harden when it’s chilled) and some more shredded coconut to help it thicken up if you think it’s salvageable! These look so yummy! I can’t wait to try them! Love that they’re no- bake. Trader Joe’s now has coconut cream in a can. Could I use that? So excited to try these they look delicious!! Hi Heather, that coconut cream should work just fine. Enjoy! I just made these with some minor changes since our maple syrup is imported and costly. I used agave syrup instead and used a sugar free chocolate and OMG, they are amazing!! What can I substitute for freeze dried strawberries if I can’t get them. Would making dehydrated strawberries work?? Hmm, it wouldn’t be quite the same with dehydrated strawberries, but it would be better than using fresh! You’ll just want to make sure they’re very finely chopped. These are amazing! Just made them for a luncheon serving 30 people. So easy to make…everyone loved them. Just be sure to leave time for chilling as they are very soft until you do. We stuck them in the freezer for a few minutes to speed the process up, then put them in the frig after dipping as they are so good cold! Great recipe, Rachel! Hi Jess, I think it will end up way too liquidy if you used fresh or frozen strawberries here, I would stick with freeze dried.